Found one file extension association related to The Geometer's Sketchpad and 1 file format developed specifically for use with The Geometer's Sketchpad. 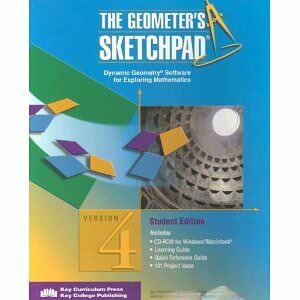 Spanning the mathematics curriculum from middle school through college, The Geometer's Sketchpad is a dynamic construction and exploration tool that adds a powerful dimension to the study of mathematics. Versatile and easy to use, Sketchpad allows students to understand mathematics in ways that are not possible with traditional tools—or with other software programs. With Sketchpad, students can construct objects, figures, and diagrams and explore their mathematical properties by dragging objects with the mouse. As shapes change, all mathematical relationships are preserved, allowing students to examine an entire set of similar cases in a matter of seconds. With its friendly user interface, Sketchpad is easy to use and lets students focus on the mathematics, not the software. It works with an overhead projector, with one or two classroom computers, or in a computer lab. Plus, you can quickly and easily generate teaching aids such as worksheets, tests, reports, and presentations by exporting Sketchpad files to word-processing programs and spreadsheets, other drawing programs, and the Internet. If you need more information please contact the developers of The Geometer's Sketchpad (Key Curriculum Press), or check out their product website.